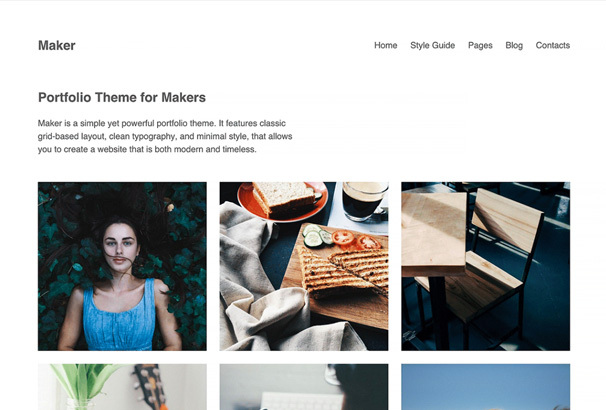 Grid based WordPress themes are perfect for displaying your images in a tidy and organized fashion, you can use these free themes for design or photography portfolio websites or a pinterest style website. If you would like to create a website with a grid layout which would be perfect for creating your portfolio website then WordPress is a great choice – the platform is free to download and install on your choice of web hosting. WordPress is open source which means you can use it free of charge, you an also download themes which provide the look and functionality of your website free of charge as well. 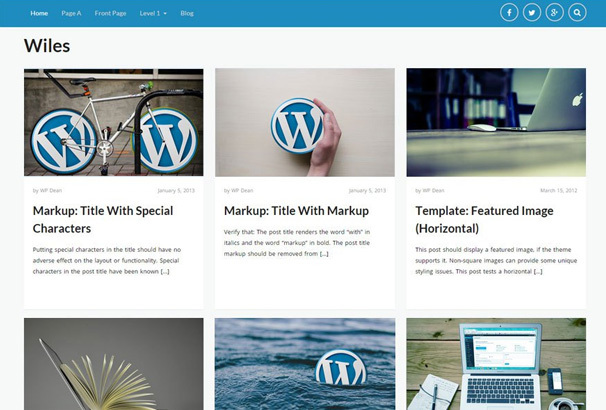 We have hand-picked over 20 great WordPress themes which organize their posts into a responsive grid pattern so they will resize and look great no matter what size screen you are viewing them on. 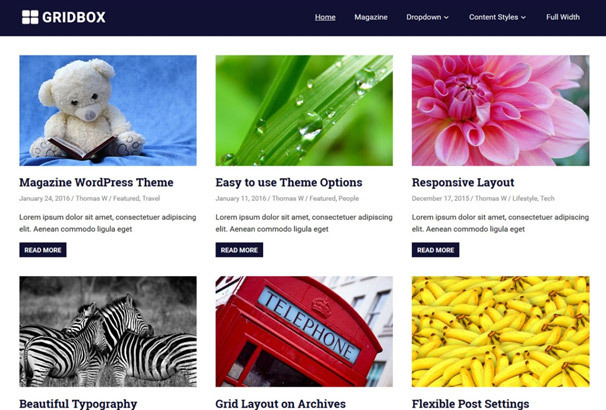 These themes have all been tested to work with the latest version of WordPress and coded to the high standards expected from the official directory. We have selected them based on their attractive modern designs so you can get your grid based website up and running in no time at all – take a look below and select the perfect theme to suit your needs. 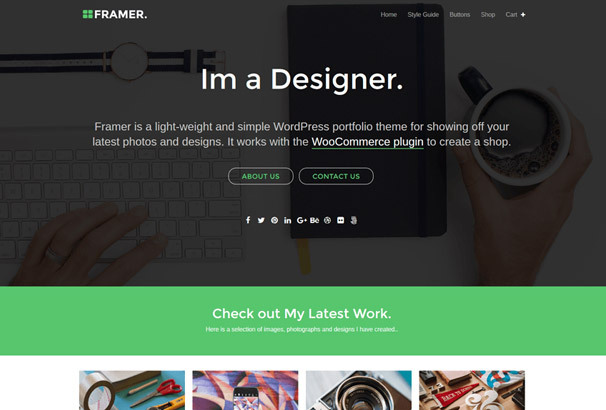 Framer is one of our own themes, its a portfolio style theme with a large header at the top for displaying an image, some hero text, buttons and social media links and the main post area is underneath which arranges your posts into a neat grid layout. The theme is responsive and comes with some customization options so you can change the color, header opacity and so on. 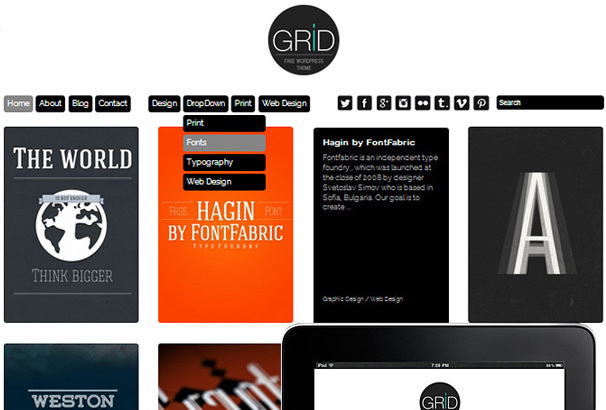 Gridster is another theme that we created and is free to download. 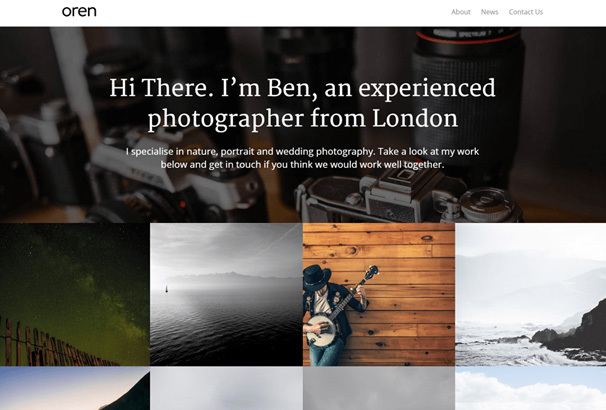 It was designed as a portfolio theme for photographers but it is just as suitable for anyone who needs their posts displayed in a grid with a sidebar on the left hand side. 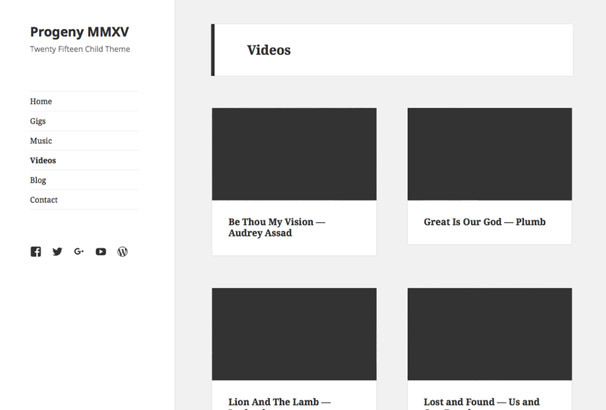 Full responsive with some nice styling touches. 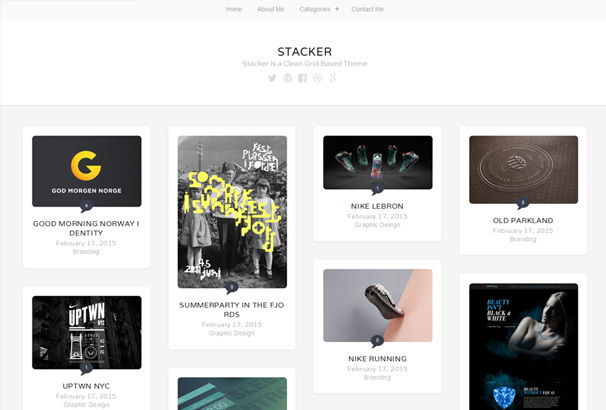 Stacker is another of our free themes – it uses a masonry layout which means the homepage grid changes as you resize the website. It’s great for showing all your designs and photos of any size and the header includes space for your social media profile links. 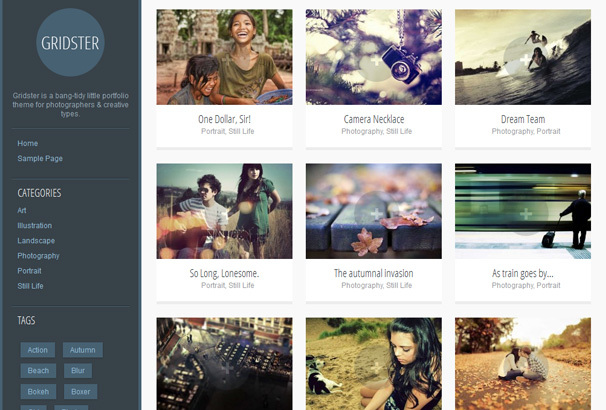 Artifact is yet another of our free themes for photographers, artists and designers. 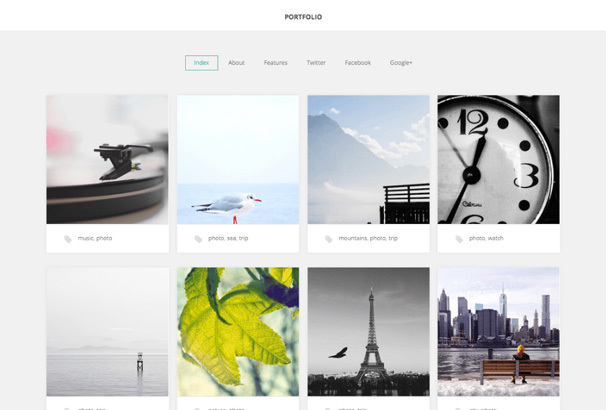 It’s a simple minimal layout designed to show off your images with minimal fuss in a simple grid arrangement. 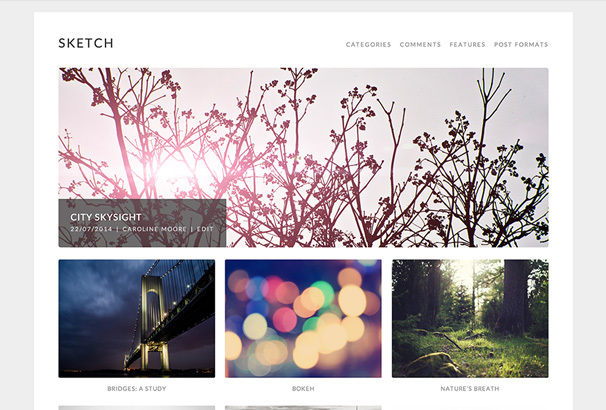 Hatch is a free photography theme from our sister website AlienWP, it has a clean white layout with a grid layout for your images and one large image on the homepage. 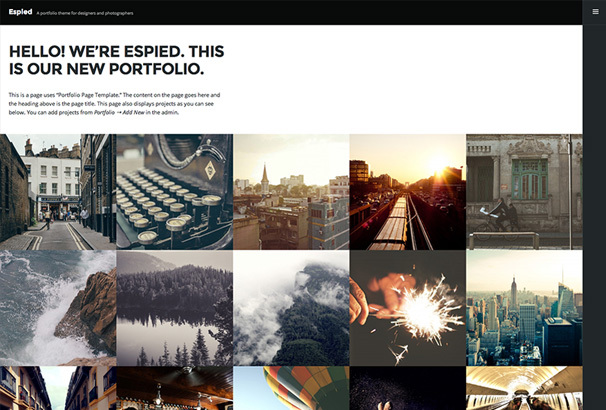 It is used by thousands of designers and photographers for their portfolios. 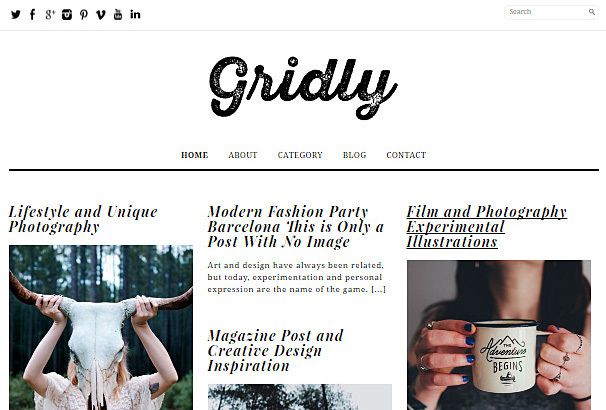 Gridly is a minimal blogging theme which uses a masonry layout one the homepage – lovely clean design for lovers of minimalism. Grid uses a masonry grid layout and infinite scroll for the homepage which is perfect for creatives to showcase their work. 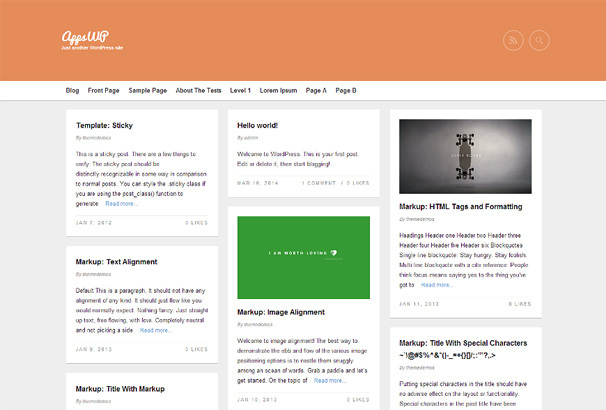 It would also work well as a blog theme which uses visual elements. 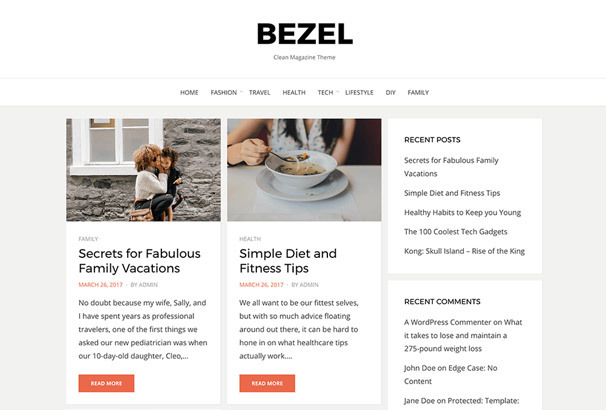 Bezel uses a 2-column frig layout with the sidebar on the right hand side. It has a minimal design which would be perfect for a number of different types of blogs or personal websites. 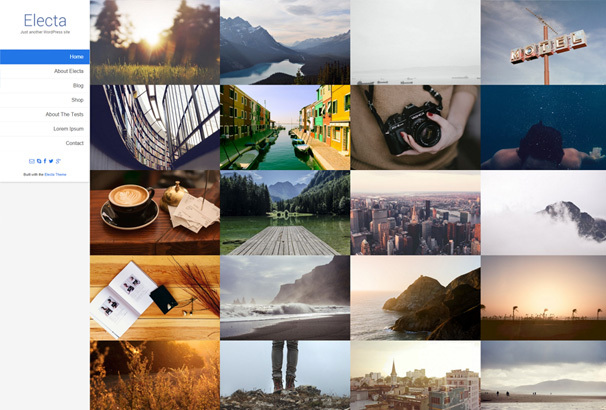 Grid Box could be used for blogging or a magazine website – the homepage arranges your posts into a 3 by 3 grid pattern which displays a featured image, post title and post meta information and a “read more” button for clicking through to the single post. 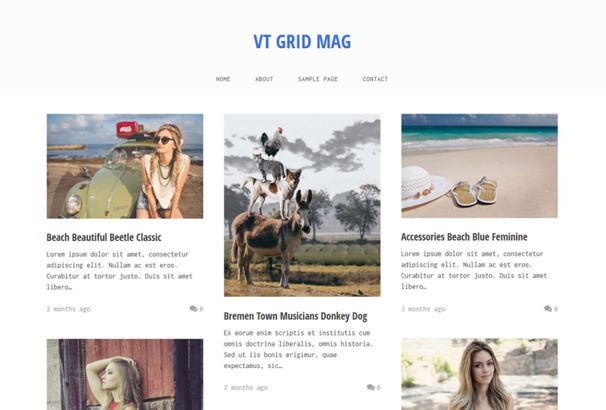 VT Grid Mag uses a masonry style layout which allows you to display different size featured images on the home page which will arrange themselves into a tidy grid. This one could be used for a portfolio or personal blog. Progeny is a Child theme to be used with the Twenty Fifteen theme which changes the post layout display into a grid layout – really nice theme which makes a subtle change that makes it look much nicer. 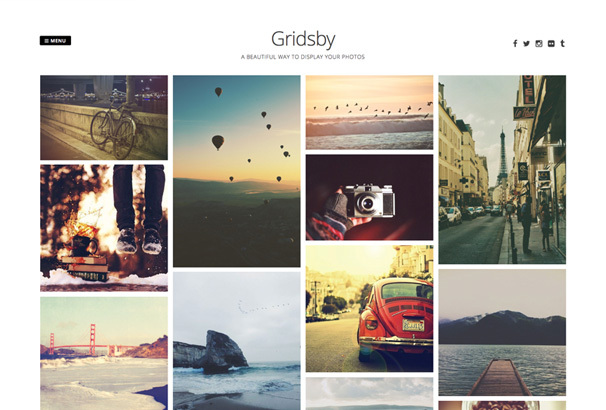 Gridsby is a perfect theme for photographers which simply displays your images in a pinterest style grid pattern. 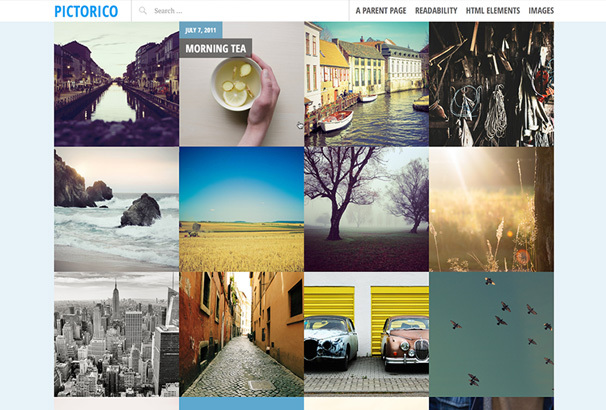 Its responsive and retina ready and lets you post photos on the homepage in a gallery. Gridyz is powered by jQuery Masonry and is a blog or magazine theme with a flexible layout and lots of options which allow you to customize it to match your requirements. 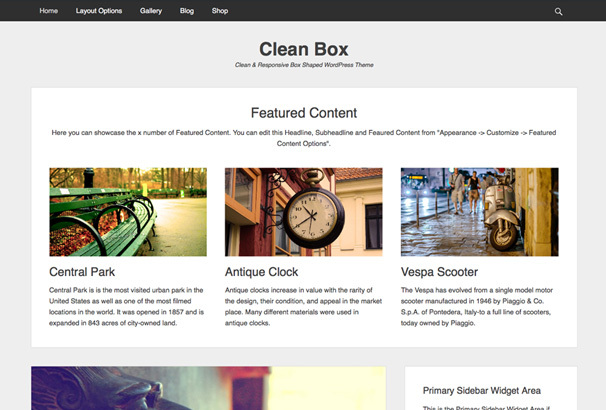 Clean Box is a simple theme which would be a great starting point for building your next website – top header bar with a search box, content area with your posts arranged in a 3 column grid layout makes it a good choice for many types of websites. Maker is a minimal and clean portfolio theme with a designer feel – would be good for web designers, typographers, graphic designers and and photographers. Simple elegant and beautiful make this one highly recommended. Metro Pirate uses a sidebar menu system and displays your posts next to it on the right with a grid and mouseovers for the post titles and information. 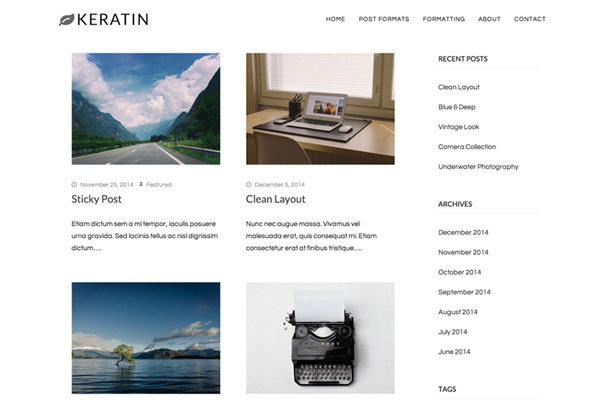 Keratin is another minimal design which displays your posts in two columns and has the sidebar on the right and a menu above. 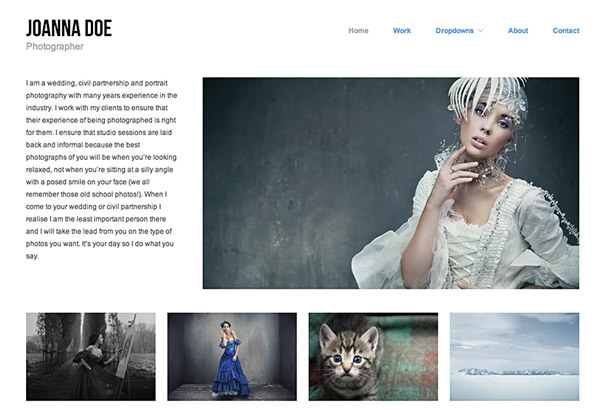 A perfect starting point for creating magazine sites, blogs and portfolios. Electa puts your images on display in a tight grid with a responsive design so you can really let your work do the talking – the side menu is responsive and allows you to display your menu items, social links and any other widgets of your choosing. 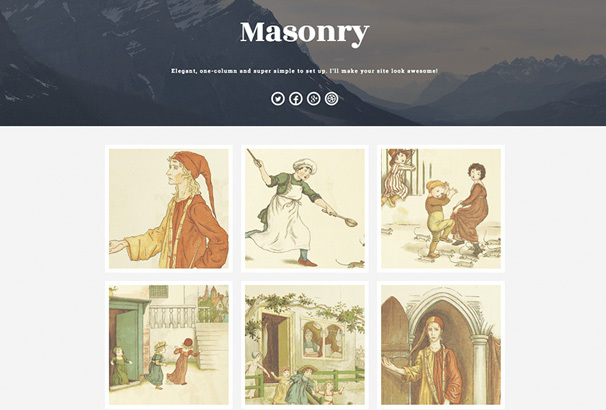 Masonry as the name suggests uses jQuery masonry for the displaying of your content, the header area allows you to upload a background image and display your site title or logo, tagline text and social media icons. 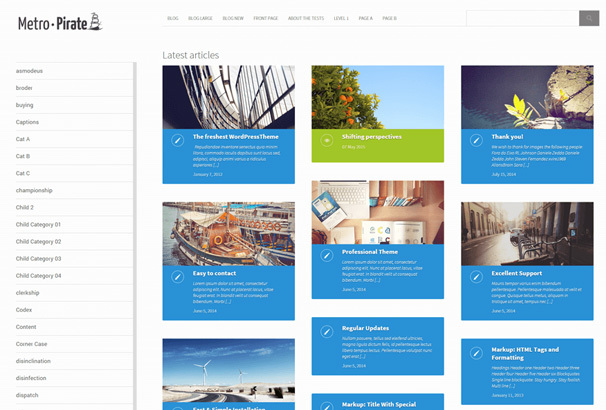 A single column theme which is a great choice for a portfolio with your images displayed in a grid with mouseover details and space in the header for a search box, logo, menu and the theme is responsive and modern looking. A creative theme with a minimal layout and design styling makes this one an ideal choice for people who need to show off their imagery. Photos and other images are displayed on the grid along with their title allowing visitors to click through for more information. Olevia a a beautifully clean example of a grid layout – simple styling, logo and menu are placed above your images which all fit together in a perfect tiled layout. Oren is a more bold choice, with a large image based header where you can place some text about yourself and a grid below it make this one an ideal photography website for displaying your images. 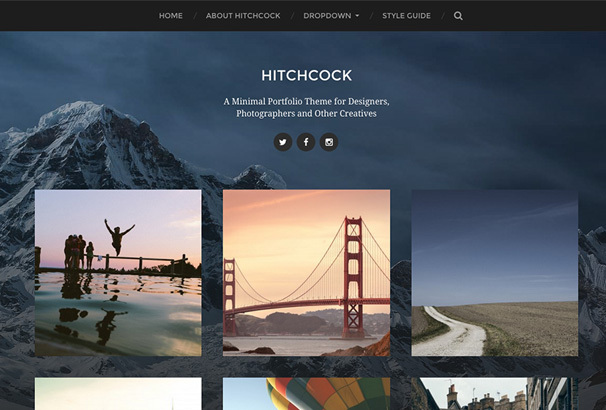 Hitchcock uses a header background image with site title, tagline and social media profile links with a menu and search box above. 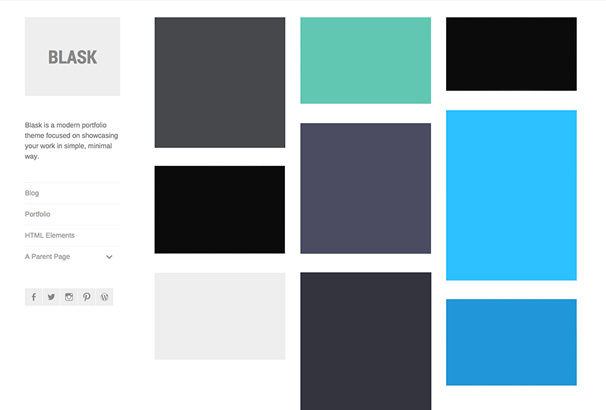 Below you have the 3 column grid layout which shows off your posts with featured images. 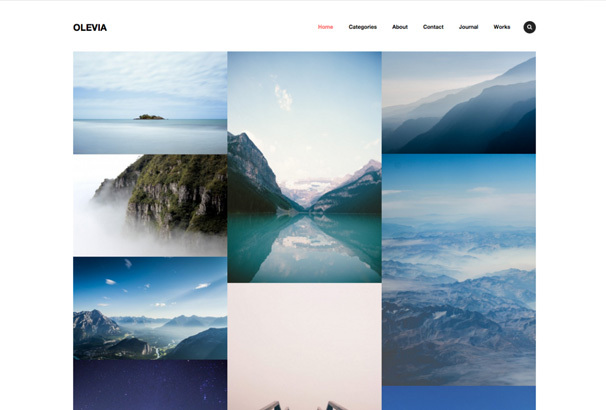 Blask is another one of the “ultra minimal” style WordPress themes which arranges your posts into a grid of varying sizes which allows you to upload any size featured image and have it fit into the pattern. Menu, logo, social media links and so on are located on the left hand side for ease of use. Wiles is a basic but functional looking theme which is designed for magazines or blogs but uses a grid for displaying your latest posts along with date, author, title and featured image. Luna has a 4 column grid layout and large image header, this one could be used for blogs, portfolios, eCommerce sites or any other type of site which uses visual imagery. 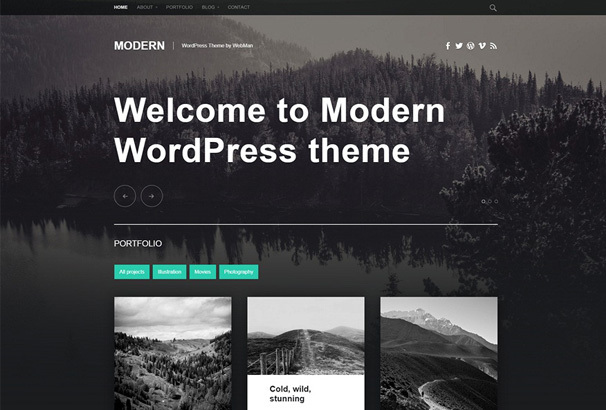 Modern as the name suggests has a nice modern clean layout with full page background image, latest posts and portfolio, social media links, top header and lots of options for customizing the theme – take a look at this one as we highly recommend it. 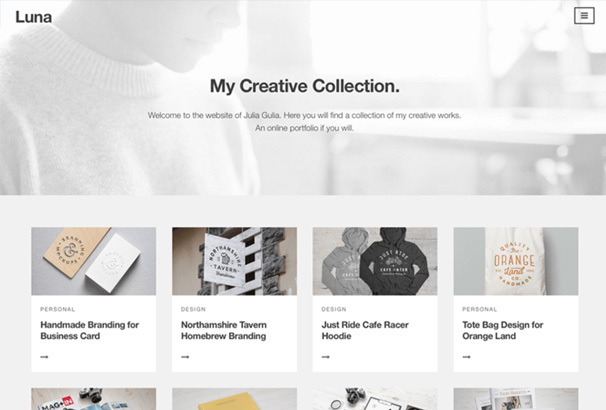 Sketch uses a layout with one post large at the top and smaller posts in a grid underneath, simple functional and stylish, it could be the basis of your new online portfolio or personal blog. Espied is a great looking and bold theme with a full page grid which resizes on different size screens, a slide out menu, header area and support for a lot of the main plugins you could wish to use. 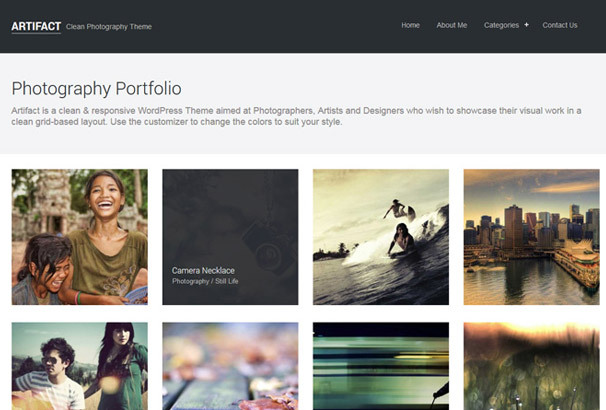 Can i download free version of “Showcase – Grid and Masonry WordPress Blog Theme”? I want to try it on my website before going for the pro version. You know more themes like this ?